At this year’s E3 Microsoft, Nintendo and Sony all presented their own vision of how the player will interact with games in the future. Microsoft introduced Project Natal, a full-body hands-free game controller, which had previously been hinted upon early last month. You can check the concept video here. Sony demonstrated a wand like motion controller which works in conjunction with the Playstation Eye. And Nintendo revealed the Wii Vitality Sensor, a biosensor add-on for the Wii controller. Sadly Nintendo didn’t reveal any specific details (or games for that matter) on how they intend to use the sensor. However from what little they did provide its likely Nintendo are going to start with stress management games similar in nature to Healing Rhythm’s Journey to Wild Divine series. Given the relax-to-win game format is very common in biofeedback based stress management, I’m suprised a game demo was not forthcoming. Oh well, E3 isn’t over as of yet, so they might reveal some more information. Next we’ll have a look at the type of experiences the Wii Vitality can be expected to provide. This entry was posted in Musings, News and tagged biofeedback games, Nintendo, physiological games, stress management on June 3, 2009 by Kiel Gilleade. I wonder if the vitality sensor is intended to act as a plugin to the Wii Fit range – to simply add heart rate as a display during an exercise routine (as already happens on some machines in the gym). Or perhaps they’ll be more creative? Hopefully that’s not the extent of their imagination. Though I do expect Nintendo to start with exergames which adjust difficulty to physical exertion (as measured by heartbeat rate). It’s easy to implement and a commonly taken approach. What I’m hoping for is some thought to either physical exertion based games like. In this boxing game, the game provides a workout by measuring the player’s current heartbeat rate and presents enemies that require moves that push the player to exert themselves at different levels. For example if the player has a heartbeat rate below the required level an enemy that requires a high level of exertion is spawned. In this manner the physical exercise is naturally built into the game and doesn’t feel tacked on like so many exergames you see in gyms (e.g. peddle to make Pac-Man go faster). I’m also hoping for affective games outside the traditional stress management route (e.g. Fairies, game manipulates player perception to heartbeat rate to encourage play). More of which I’ll write about later tonite after work. 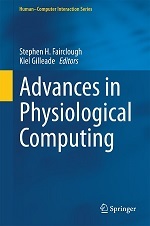 Pingback: Physiological Computing : Will the Wii Vitality every reach 99% of all customers?